Refrigeration and air conditioning may become more efficient and environmentally friendly thanks to the patent-pending work of LSU physicists. 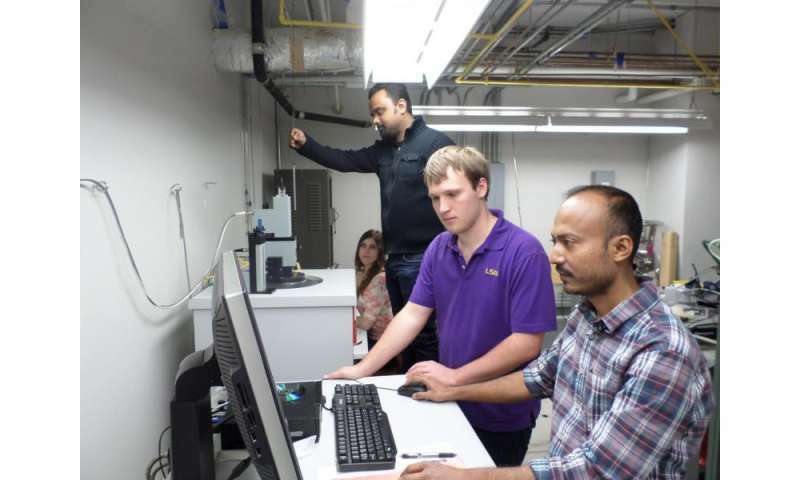 The team of researchers led by LSU Physics Professor Shane Stadler has discovered a breakthrough magnetocaloric material that may change the energy industry, including air conditioning and food refrigeration. "The world refrigeration market is expected to increase by about $7-8 billion by 2018," Stadler said. Therefore, his breakthrough has a significant economic impact as well as an impact on the energy industry and environment. Stadler's research focuses on the next generation of magnetic cooling technologies, which are simpler in design, quieter and more environmentally friendly than conventional compressed-gas systems currently used. "LSU's basic research into low temperature physics and materials science has potential applications in areas related to energy, electronics and the environment," said Michael L. Cherry, chair and professor, LSU Department of Physics and Astronomy. "Professor Stadler's magnetocaloric materials program is an example of this research that appears to be directly relevant to energy development and Louisiana's economy. It also provides excellent training opportunities for Louisiana's students." "We've studied these systems for a long time, and were fortunate to discover a system in which a magnetic transition coincided in temperature with a structural transition," Stadler said. "That this magnetostructural transition occurs near room temperature is what makes it a strong candidate for magnetocaloric cooling devices of the future." Stadler's team's technological discovery is a promising alternative for refrigeration and air conditioning that can reduce the use of harmful gas fluorocarbons. "We are excited about the potential applications that are available for Dr. Stadler's technology," said Andrew Maas, assistant vice president for research over technology transfer and director of the renamed Office of Innovation and Technology Commercialization. "The Department of Energy, General Electric and other companies around the world have been working with magnetocaloric materials for some time. Dr. Stadler's solution addresses many of the issues that these big players have encountered." Currently, a local group of entrepreneurs have expressed interest in this advanced technology. After further testing, they will look into developing commercialization opportunities utilizing it for the heating and cooling industry. The improvement of our cooling technology is more than just an environmental impact issue. In deed, if you subscribe to global warming, then energy efficient and effective air conditioning and food refrigeration are important adaptation strategies. And as we know from science, the species that fails to adapt, dies. How much more efficient is it going to prove to be V Peltier effect coolers? @AZWarrior The article is equating "no compressed gas coolant" and "environmentally friendly". There's no mention about the electrical requirements such a system would have, i.e., is it more than a conventional system. If so, it's environmentally friendly like electric cars are. Looks like a big step forward, but the footprint remains effectively the same. And there, in a nutshell you have the AGWites. It's a whole new line of marketing, not any kind of real response to AGW, betraying the fact that they don't believe in it. It's a money making opportunity, as the article states. Why? Looks green. Why is that worth paying more? The hype. Meanwhile, if they really believed the hype, they'd turn off the AC or move somewhere they don't need it. They don't do that. It's about OUR behavior, not theirs. As pointed out, they often endorse solutions that have NO EFFECT on footprint. Doesn't sound like they believe their own rhetoric. Pretty obvious, no? You are all full of it. It says in the article it is more efficient than heat of vaporization systems we use today, and has a solid working fluid. And why did you all determine it required excessive power for it to change magnetic state? Who concluded? I asked. Reading is fundamental. I'll believe it's a crisis when the people who tell me it's a crisis start acting like it's a crisis. Adapt? Where are the 100 1000 megawatt fission plants we need to power the 'lectric cars? Climate arguments aside, we spend a significant fraction of the energy produced to cool homes and businesses. A more efficient cooling system for refrigeration and buildings would be very welcome. Unfortunately, from this article it is hard to tell how much of an improvement they're discussing here. Refrigeration is a big player in the cost of food, and operating server farms. This is the kind of advancement that can actually lower cost of living noticeably (provided the energy discount is significant enough to spur conversion).
" Where are the 100 1000 megawatt fission plants we need to power the 'lectric cars?" Collect the pieces at Fukushima and build your own. @greenonions I couldn't fail to disagree with you less! And there, in a nutshell you have the AGWites. Freon is a global warming gas. This "solid state" cooling process is significantly more energy efficient than the conventional, compressed gas systems currently on the market today. Moving right along, now that we've discussed increased efficiency, this of course means less energy consumption, which means less carbon emissions, which means less global warming for the same amount of refrigeration and air conditioning. Peltier coolers are mostly useful where the primary consideration is space and/or mass. For example, I have an astrocamera with a Peltier cooler on it; I can hold it in my hand. Following the link to more information, one discovers that it's possible to get the magnetocaloric effect- and in fact what is called a "giant" magnetocaloric effect- by rotating the magnetocaloric material in a static magnetic field. Thus, no power is required for electromagnets that can be turned on and off; just a motor to rotate the material within the magnetic field from ordinary magnets, and a fan to cool the hot side, and a pump to move water through it. No compressor, better efficiency. Most of the power in a refrigerator is consumed by the compressor. The problem with Peltier coolers is that the heat transmission through the device follows the current linearily, but the energy loss in the device follows current squared, so the efficiency drops at a factor of 2 as the power increases. At low power, peltiers can easily reach a CoP of 3-4 over modest temperature differentials, but the trouble then becomes the large number of devices needed to achieve high cooling power. just a motor to rotate the material within the magnetic field from ordinary magnets, and a fan to cool the hot side, and a pump to move water through it. No compressor, better efficiency. Most of the power in a refrigerator is consumed by the compressor. This thing isn't a free energy machine. Re-ordering magnetic domains requires work, which is what shows up as heat, and therefore a force must appear that resists the motor turning the magnetocaloric material in the magnetic field. This force is analogous to the torque and power required to turn the compressor in a regular fridge. Most of the power is still going to go into turning the motor to pump the heat. Only, there's less friction involved since we're not pumping fluid through pipes with a piston pump. tear88, we in Technical Services had a large unit running in the 1980's as an experiment for the Gas Research Institute. I think it took up too much room. It was about the size of a shipping container. High grade magnetic materials lose their properties quickly at high temperatures, so the applications for heating may be limited or problematic. Cooltech Applications already claim to have their commercial magnetic refrigeration unit available. This thing isn't a free energy machine. . Please don't do this. It's impolite. Uh no you rank amateur there is no phase change. Its solid state. -guess you missed the lunch-and-learn about solid state systems. -guess you missed the lunch-and-learn about solid state systems." Guess YOU missed the part where I was referring to the dessicant cooling system directly to tear88. otto, before you go off with silly accusations, get it right. Have you apologized in the other fora yet? is more efficient than heat of vaporization systems we use today, and has a solid working fluid. And why did you all determine it required excessive power for it to change magnetic state? -And so we find out that gkam the pioneer doesnt know what 'solid working fluid' means. We already know you like to throw tech terms about for effect. Why? You and your buds were wrong. As usual. Swimming pools cant be (and arent) used to cool houses. -including your dessicant system. No? Okay, Toots, give me the total average specific heat content of a household pool with a delta-T of 15F. Come on, Mister Mouth, I am going to step you through the calculations so you can stay with me for your apology. Well now, Ottotheidiot has struck again. See ya, Eikka. I don't bother with ugly people. Sorry mr mouse Eikka already attempted to convince you. What, did you forget already? Bad sign. A man would do his own calcs, in the RIGHT THREAD. But you're the old man who has to pretend he's never wrong, and was something he never was. THIS thread is the one in which you got 'solid working fluid' wrong. Yes? Come on, Mister Mouth. Okay, give me the average size of household swimming pool and I'll show you how to do it. Hey gkam: Go with 5m x 15m (16.4042ft x 49.2126ft) and say 2m (6.56168ft) depth. This is close to average for an in ground rectangular pool with slope averaged out to about 6ft. Round however you want. Use 'merican units if needed. a pool 16 X 50 X 6 ft holds 4,800 ft3, or 300,000 lbs of H2O. A 15-degree delta-T gives us 4.5 million Btu, divided by 12,000 Btu/ton-hour, reveals we have 375 ton-hours of A/C available in that pool. That is heat you do not have to pay for heating the pool. And you can get much of it back in Winter. -and Im not going to argue with you about it. Eikka already proved you wrong, in THAT thread. And you are UNABLE to argue about it. Shall I explain the calculations? Confused about tons and ton-hours? Fact is, you have never done even an easy calculation like this one to survey potential, have you? And you can get much of it back in Winter. The pool loses the heat you add to it in a matter of days to weeks by evaporation and radiation, and convection to the ground. There's nothing left of the heat come heating season. Hey Eikka, pools are heated. Do you suppose there might be a good reason for insulating them? Yes, it is a good idea - but pools still lose heat. That's why you keep heating them. Otherwise the idea of using swimming pools as A/C heatsinks would not work in the first place: if they didn't lose massive amounts of heat continuously, the water temperature would keep rising and rising until you couldn't swim in it any longer. If you insulate a swimming pool to the point that it retains heat well into the winter, it becomes a very large water boiler, and you couldn't swim in it because the top would need to be completely sealed from evaporation. "Otherwise the idea of using swimming pools as A/C heatsinks would not work in the first place: if they didn't lose massive amounts of heat continuously, the water temperature would keep rising and rising until you couldn't swim in it any longer." Eikka, you have been Wikied! I showed you how to do it without any evaporation, using just the specific heat of the water. The pool needs heat,. while the house is dumping it. It is very straightforward,but it was my entry, so otto and you decided to not like it. If you cannot find who has already done it, then the failure is yours. I suggest a short course in double-duct to VAV conversion. Mike, you studied EE? I was a Test Engineer for National Semi, and the LM555 was my first product. I designed special cables and fixtures, then tuned the computer program and the timing of the Measurement Systems to the device, and we put them out by the millions. Did you get into herterodyning? IFs? In the war, I heterodyned an unmodulated signal generator into a connection with the antenna and a VHF-101, to get the base radio station. It was just in time to hear us lose the Scorpion as it happened. We are still lying about that disaster, and it still haunts me. Great, used it many times, versatile device. We ran out of them for a while and turned to the 74C14 which allowed 6 RC independent timers with diodes for logic, basic but reliable. Summer around 40C, winter 22C, some pools to 24C Summer down to 17C Winter. LOL, far more likely it loses esp above ground. Australia is perfect, Summer small rise in H2O temp tolerable, in any case some heat lost at cool nights primarily evaporation/radiative. For winter with wood stove one could plumb in pipes to move some of that heat through to warm bedrooms & also cycle to pool so its bit warmer for that morning wakeup. Only issue here is to manage evaporation as water costs rose but, most have water tanks for rain anyway so all depends ie not turnkey ! My film badges we wore working on the beams showed nothing either, but we all know we got something. The big problem there was the X-rays produced by the beam interacting with metals. Typical X-ray units use kV,but we were in the 1-3 MV area, and produced higher-energy rays. The National 555's were second-sourced from Signetics, but we had to do our own design and production engineering. Good learning experience. We ran the entire test area in Digital, ten handlers and probers on one Teradyne J-283, using the 18-bit M-365 Computing Controller. We needed several different systems for the linear devices. The weather situation in California, especially in the interior and southern portions of the state, are much like Western Australia, and using the pool for a heat sump would work well here too. In fact, there are even "solar" pool covers that will add heat from the Sun. There are claims that they pay for themselves in reduced pool heating costs, but I view that with a certain amount of skepticism; their figures seem a bit optimistic. How much it would help would be dependent on the local weather, but every little bit helps. oops stating 'help' in this context surely, does NOT mean 'help it along' or increase, guess you Really meant to retard it, NOT help evaporation. Pool heating for wimps ! Ahhh, the perils of folks who *think* they speak the same language!